Registration for the Summer STEM Academy is easy as 1-2-3! Our Online Registration system allows parents and guardians to register and pay online. 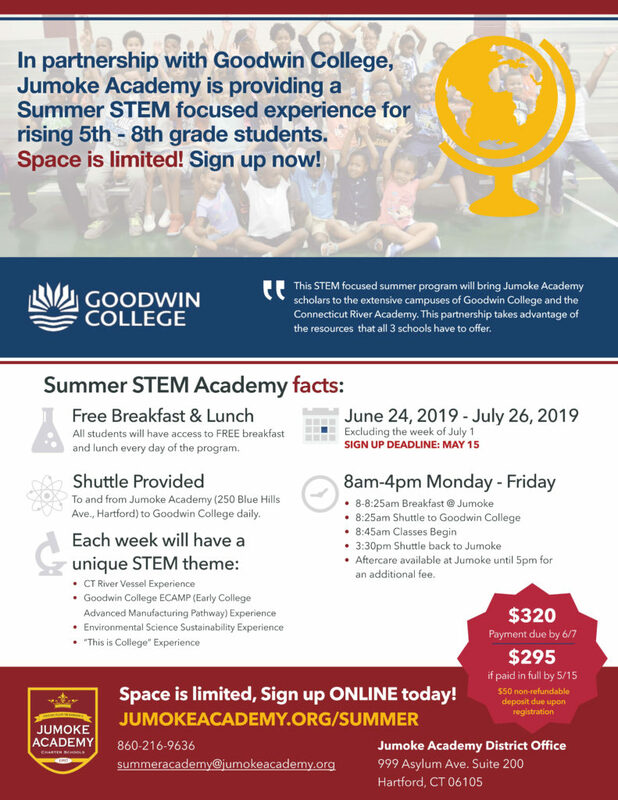 Step 1: Submit your Summer STEM Academy Registration for Summer Academy (or scroll down to fill out below). Step 2: Submit your payment. A $50 non-refundable deposit is due at the time of registration and the remainder is due by 6/7. Special discounted pricing for registrants who pay in full before 5/15. Step 3: Download, complete and return additional forms as needed (General Permission Slip 2019, Permission to Administer Medication Form , 2019 Summer STEM Academy After Care Packet ). Forms may be returned in person or by mail to Jumoke Academy, 999 Asylum Avenue, Suite 200, Hartford, CT 06105. Registration paperwork will not be accepted at any other Jumoke Academy building. Looking for Summer programing for K-4? The Hartford Friendship Kid’s Camp will be held at Jumoke Academy. Click here for registration information!